When outofsmudges posted her 7 Deadly Sins of Beauty on her blog, a throwback to when the theme was circulating online beauty communities a while back, I thought it’d be fun to do my own version. So here they are: My beauty picks for greed, wrath, gluttony, sloth, pride, lust and envy! GREED: What is your most expensive beauty item? What is your most inexpensive? Definitely, this award has to go to Estée Lauder’s Re-Nutriv Ultimate Diamond Transformative Energy Creme, which goes for $360, and La Mer Genaissance de la Mer, which retails for a stunning $620. They’ve now been relegated to the land of empties (sob), but it was so good while it lasted (which was a long time, actually). The super heavy, super substantial gilded tub with faceted lid made me feel like nobility every time I held it in my hands, like it was some kind of treasure. The cream itself was amazing as well — really rich but not heavy, incredibly hydrating, and the best primer ever. Of course, I have to admit that this is a bit of a cheat for me because, as a beauty editor, I get products sent to me all the time, and those two are no exception. So if we’re talking about a beauty item that I’ve actually purchased recently, it’d have to go to Skinceuticals C E Ferulic, which is $163. Beauty editors rave about this serum, so I finally gave in and bought it when Dermstore was having a sale. My most inexpensive beauty item — and this one I purchased — is Maybelline Waterproof Ultra Liner ($8). I’ve raved about this liquid liner before — it never runs, it’s waterproof (I’ve tested it in the pool), and is my go-to on any vacation because I know it’ll last all day. I’m always on the lookout for a good sunscreen, and by “good” I mean: broad-spectrum, preferably a mineral/physical sunscreen (zinc oxide and titanium dioxide), a light texture, fast absorbing, and doesn’t make me feel hot, stuffy, or sticky. I know — basically I’m looking for the impossible. But I do have some sunscreens that have come close. 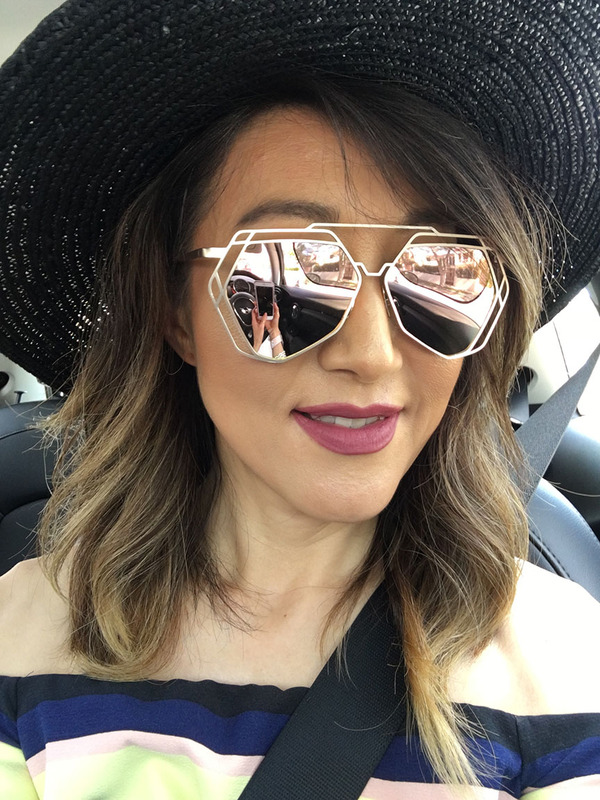 Clarins UV Plus, Paula’s Choice Resist Super-Light Wrinkle Defense SPF 30, Shiseido Urban Environment Tinted UV Protector, and La Roche-Posay Anthelios 45 Ultra Light Sunscreen Fluid are all my sunscreens of choice. They’re not perfect (Clarins and Shiseido has alcohol in it, which probably attributes to its thin texture), but these are the sunscreens I turn to again and again. Ooo, I have a couple. Clarins Instant Light Lip Comfort Oil is the answer to my dry, dry lips. I love everything about it, from the extra fat, extra plush doe foot applicator that just hugs my lips to the ultra hydrating and true-to-name comforting oil that hydrates my lips like nothing else to the rectangular, gilded-capped tube. 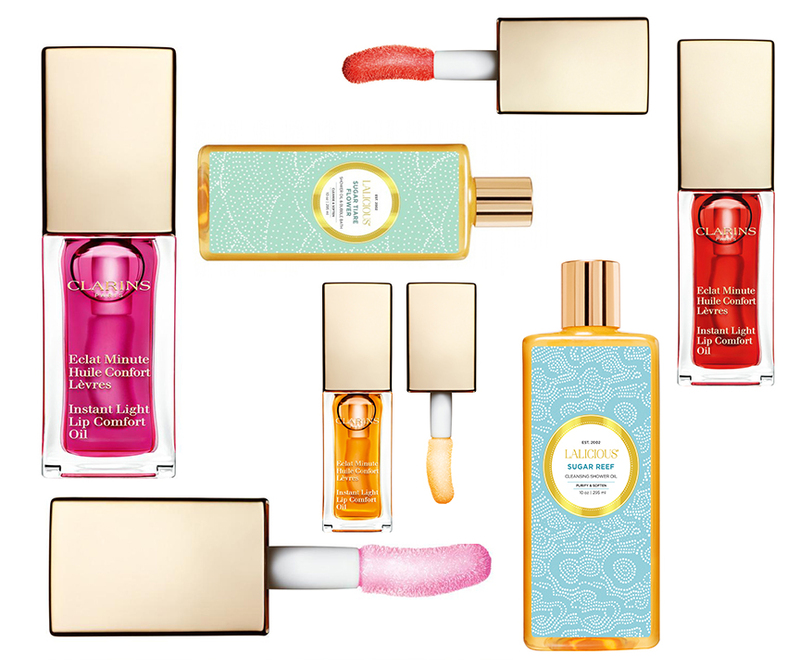 And while I’m not a huge fan of Clarins’ heavily scented and sometimes overly sweet fragrances in its beauty products, I have on complaints about any of the three scents the lip oils come in — red berry, raspberry, and honey — perhaps because the overall experience of applying the lip oil is just so heavenly. The other delicious beauty product I can’t live without is Lalicious Shower Oil, again a boon to my dry skin. I never thought I would like a fragranced body wash so much, much less one that is an oil and yet still lathers deliciously. The sugar tiare flower and sugar reef shower oils are perfectly refreshing and make my shower time just that much better. The answer’s easy: any hair styling tool. I recently go the Revlon One-Step Hair Dryer and Styler, which blow dries your hair as you straighten, so I’m hoping that’ll help me up my hair game. We’ll see. Even that might be too much effort. Lately, it’s been the overlined matte lip using Milani’s Amore Matte Lip Créme. I’m still experimenting with colors and exactly how much overlining to do (it’s like trying to re-create the blowout your hair stylist just did — I always come up a fail), but when I do manage to somewhat approximage the look, I feel like a different person: My teeth look whiter, my facial proportions seem more balanced, and I finally look like I have the lush, full lips I envy. See my before and after here. Physically, height, broad shoulders, and moon eyes when they smile or laugh. Personality-wise: humor. But not a cutting, sarcastic humor. Humor that is insightful and intelligent. Since we’re talking beauty, I’m assuming this question means a beauty gift. And for that, definitely the accoutrements of beauty, like vanity trays or scented candles — items to decorate and embellish my boudoir. After all, I spend so much time caring for my skin and doing my makeup, I want to make my surroundings as attractive and serene as possible, so I decorate with flowers and scent the room with candles. 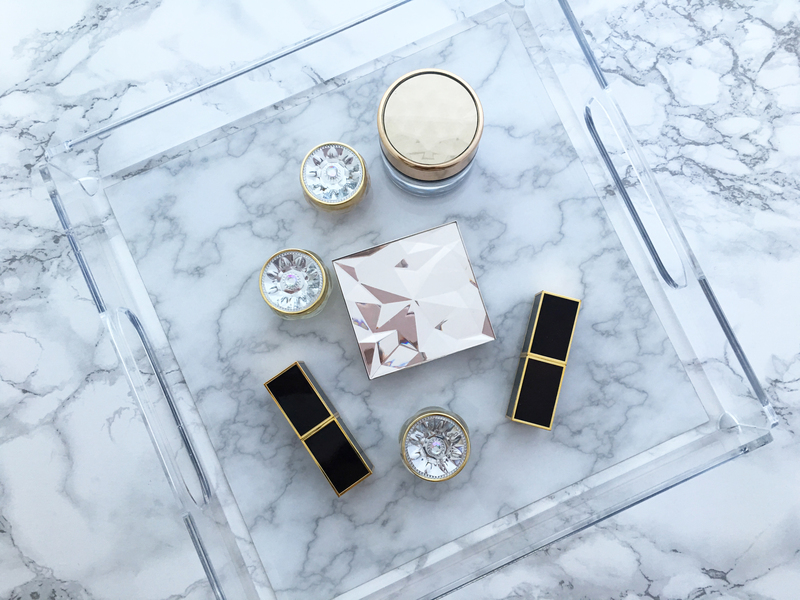 Oh, how I love a good vanity tray — I have them all over my bathroom, each a different aesthetic (a metallic croc embossed one for my glam skin care, an artsy painted one for fun makeup) and each a place where I can display my favorite beauty products. 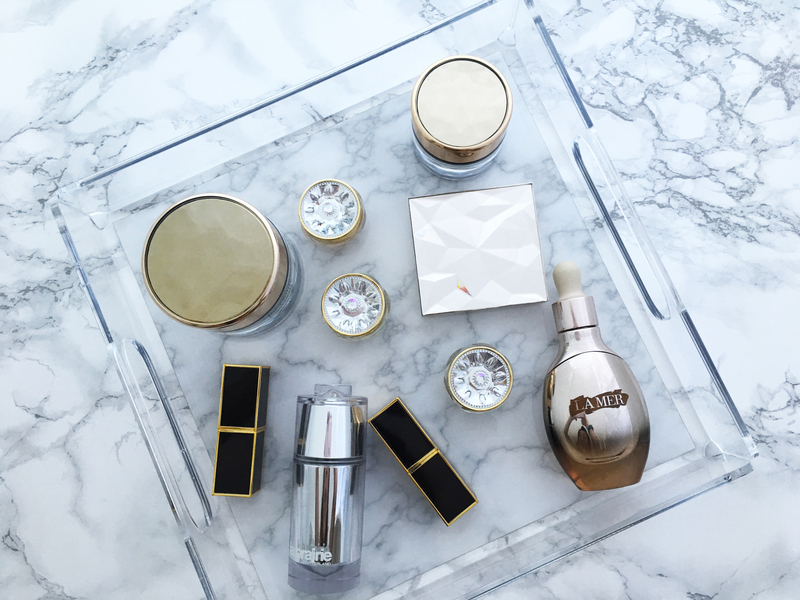 My newest vanity tray is from Zazzle — it’s a really high quality acrylic with a chic marble print, and I love how it modernizes my beautifully packaged skin care as well as complements my more minimalist products. I’ve been looking for an acrylic vanity tray, and this one is absolutely perfect, with little handle cut-outs so I can actually move the tray and its contents easily. (It makes for a great flat lay, too — I’ll be Instagramming a lot with this tray.) The best part is you can personalize any of their acrylic trays, whether with monograms or even your own favorite print or photo. Of course, I’m a skin care girl, through and through, so other beauty gifts I’d love are sheet masks from Korea and anything with beautiful packaging. In fact, if you get me a skin care product with beautiful packaging, I’ll be in heaven. What are your 7 deadly sins of beauty? I’d love to know! Love the marble acrylic tray! Here’s a modern beauty sin: caring more about how products look in a flatlay than how they perform. Guilty! Haha, sooo true! I’ve been known to keep beauty products around even though I can’t use whatever’s inside them, just because they’re so pretty!